In my last post I introduced the topic of technology in the classroom and griped a bit about my difficulty in enforcing boundaries on students’ use of personal devices. Now I hope to outline a few points that will better clarify what concerns me about technology use and what doesn’t, and just exactly what’s at stake with this issue. To be clear, the main issue is giving students access to the internet on their personal devices during class time. My frustrations lie primarily with the lack of vision with which schools (public and private alike, though I can’t speak with firsthand knowledge of public schools) have adopted policies concerning the use of these devices. There are varying degrees of acceptable-use policies here, I know. 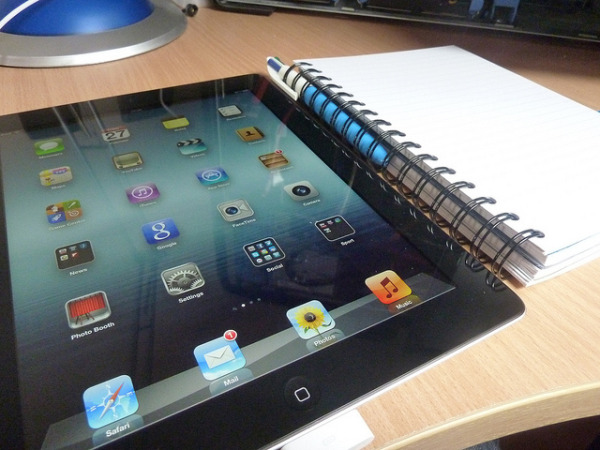 Some schools require that each student purchase a tablet; others allow students to use laptops and such for notes; some permit teachers to set the rules in their own classrooms. Yet few attempt to justify these policies in terms of how these new guidelines will help us educate; that is, how they will help students come to know and desire what is true. This is no surprise, of course, because few schools attempt to justify anything that happens within their walls on those terms anymore. Argument #1) Come on people, we are in the 21st century. Some teachers resisted the replacement of desk slates with notebooks, too. You can’t turn back time! At first glance this line of thinking makes no sense. Appealing to the simple fact that one event has had the happy chance of falling after another in the grand march of time does not make said event any better. One can imagine Hitler, in a huff explaining to the Austrians: “Come on, don’t object to all of this. It’s 1938!” What if students pushed to submit essays of no more than 140 characters, Twitter-style? They’d use the same line of reasoning, I’m sure. Taken by itself, the appeal to the progression of time has no relevance. That being said, this argument does have a point. The modern world runs on screens and devices, and my students won’t all graduate to become philosophers and professors. Most will go into some sort of business, where they’ll be working on screens constantly. I’m composing this harangue on a laptop, for crying out loud. Like it or not, communication has permanently changed, and a school that ignores this reality isn’t helping prepare students for the world. And so I’m fine with posting assignments on a class website, having students submit electronic copies of their work, and using the internet on certain days in class (e.g. for research). We need to differentiate between encouraging our students to be conversant with today’s technology and encouraging the vices associated with that technology (distractibility, inability to think deeply). I think you’d be hard-pressed to find an educator that wouldn’t see the value in making sure that students write using complete sentences, not a few words punctuated by hashtags. So boldly proclaiming that schools need to get with modern times isn’t enough. We need to clarify what we actually mean when we say that, and what we want to preserve. Argument #2) Students are distractible by nature, and will be distracted by anything. If they didn’t have iPads they’d be doodling in their notebooks and not listening to what the teachers say. Students are distractible, and by no means do I think that limiting their use of personal devices will keep them entirely focused on what I’m saying or what we’re reading. The problem with this argument is that it implies that all distractions are equal, and, well, they’re simply not. Being able to flip from reading a poem on your iPad to playing a game to messaging your Mom to looking at the terms you need to memorize for next period without the teacher being able to see what you’re doing is not the same as drawing stick figures in your notebook. A teacher certainly wouldn’t tolerate it if a student had his math homework open in English class or his Gameboy (do kids even use these anymore?) on his desk next to Shakespeare. So why are we actively giving them access to these things, and so much more, on their screens? Are the benefits of using these devices so great that they outweigh our handing students consequence-free distractions? As a teacher I can mitigate some of these issues, by teaching from the back of the class or calling out students when I see their thumbs moving behind their screens when they don’t need to be. But if I was set on eradicating the problem of device distraction I’d never be able to teach, and I’m a teacher, not a babysitter, so it remains a persistent problem. Argument #3) The digital classroom is a revolution in learning. Students have the world at their fingertips, access to the entirety of human knowledge at an instant. It’s the best thing to happen to education since the invention of writing. I agree that the accessibility of information is an unbelievable boon to education, perhaps the biggest innovation in centuries. I need to give some background on a literary movement that I haven’t studied since college? Cue Google. I want to suggest that a student check out other works by an author that he liked? I can send him links to the stories themselves, or at the very least to the Amazon page. In short time the entire library of the world will be available online. What’s not to like? I said we’d be descending here, and this third argument is the most problematic. The issue is that its practitioners misunderstand what it means to educate, which is a cardinal sin. Its ramifications are much more serious. In short, this line of thinking confuses wisdom with information. Access to facts is not the same as the pursuit of truth. It can help insofar that it remains a means to an end, subservient to a higher good. Yet it’s clear to me that putting this access in our students’ hands during class more often than not directly conflicts with my goal of having them think about things deeply. Considering the interior life, which so much of literature aims at, requires slow, deliberate thinking. It’s exactly the opposite of what personalized screens encourage. Unfettered access to information is more important outside of class than in; classroom time is primarily a time for thought and synthesis, for considering how all of this information fits together, to wrestle with questions of purpose. Aside from issues of life and death, there is no more urgent task for American intellectuals and writers than to think critically about the salience, even the tyranny, of technology in individual and collective life… There is always a lag between an innovation and the apprehension of its consequences. We are living in that lag, and it is a right time to keep our heads and reflect. We have much to gain and much to lose… the new devices do not in themselves authorize a revision of the standards of evidence and argument and style that championed in the old devices. And that’s what I’m calling for here—"to keep our heads and reflect," and take stock of the ways in which we allow students to use electronic devices in the classroom. It’s not about eliminating screens in schools; it’s about achieving a balance informed by what we consider to be the goal of education. As I suggested earlier, I think Catholic schools possess a unique response to this problem, and I’ll try to work out what that might look like in my next post. Would love to hear what other folks think. Have I just created a bunch of straw men? Am I ignoring an important angle here? Comments encouraged!